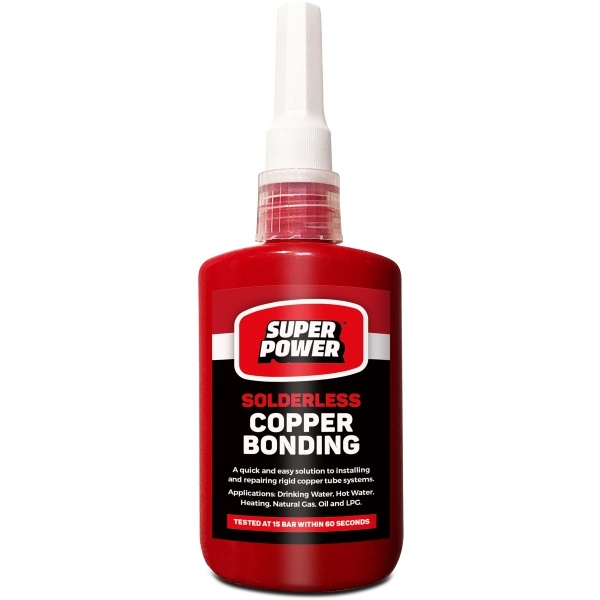 Part of our Super Power range, we are pleased to offer the Super Power Solderless Copper Bonding, used in the installation and repair of rigid copper tube systems for hot and cold drink water and heating. Solderless Copper Bonding can help you save up to 70% of time compared to conventional soldering techniques which providing the same permanent weld as a hot soldered joint. It bonds copper pipes and connectors in a quick 60 seconds, requiring no flame, flux or solder, making it quicker and easier than traditional hot soldering. Solderless Copper Bonding is also useful in areas where a blowtorch cannot be used and is much safer by eliminating the risk of gas explosions from hot works on gas lines and intentional burns.